DeckStainHelp.com has become the Internet’s go-to site for all things exterior wood surface restoration related. As before, we recommend you wait 3+ months to stain new wood surfaces to allow the wood to weather, creating an ideal porous surface that will hold the stain better. The waiting period does vary based on the stain brand and type of wood. Our top stains for new wood are the Armstrong Clark and the Restore-A-Deck Wood Stains. We encourage customer interaction on our site, so feel free to participate in our open discussion. Over the past year, we have numerous questions asked on the site, but none was asked more than “What stain or prep is needed for my new deck”? 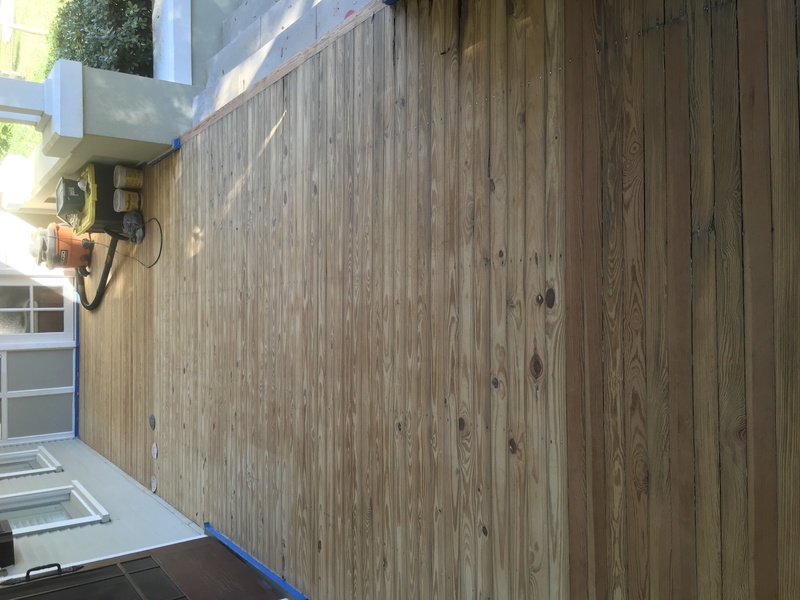 There seems to be an opinion among homeowners that is okay to stain new wood right away or even before the deck is installed. This is incorrect for most wood types and stain brands. In this article, we will cover the required prep and the waiting period needed before applying a stain for the first time. Most wood stains, when applied to new wood will have a very difficult time of penetration into the wood cells. This will result in an uneven application and premature stain failure by quickly fading or peeling. Remember, the deeper the stain soaks into the wood, the longer the life of the stain. After the waiting period you should use a wood cleaner and a wood brightener. This will remove the dirt, UV graying, and mill glaze. Let the wood dry for a few days after the cleaning. Apply 1 Coat Only of the stain! Even after the waiting period, new wood is still not very absorbent. Over applying the stain will not give long lasting results. One even coat that soaks into the wood is what you want to achieve. Be prepared to apply a maintenance coat in 12-18 months. Once you get through the first couple of years, your deck stain will perform much better as the wood will allow more stain and deeper penetration into the wood. TIP: Do not sand new wood. This will smooth the wood, reducing the stain’s ability to penetrate into the wood. 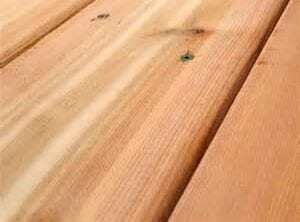 Rough sawn wood is not used for horizontal decking surface, but rather verticals such as fencing, wood siding, etc. This side of the wood does not have a mill glaze and is very absorbent. As long as the wood has a low moisture content, it can be stained right away. In our opinion, certain brands of stains will work better on new wood. Through the years we have tried numerous stains on new wood and we have found that stains that contain paraffin (non-drying oil) will penetrate into newer wood better, even coverage, and can be applied sooner. We would suggest one of these brands for new wood if you do not want to wait 4-12 months to allow the wood to weather. If choosing one of these brands, you will still need to prep the wood to remove mill glaze with cleaning and brightening. Please ask any questions you have below. I have a pressure treated wood deck that has been weathering for almost 2 years. Living in Alberta, Canada, and the deck gets full sun pretty well all day (south facing). 1) You stated not to sand the deck prior to staining. I understand the reason, but we have had our lovely dog scratch up the surface, so I am wondering if a penetrating stain will enhance those scratches? Is it worth lightly sanding and leaving it for a few more weeks prior to staining? 2) What would you recommend for a penetrating stain in our location? 1. I would not worry about the scratches as they will continue anyhow after staining. You will have to live with them no matter what. 2. Armstrong Clark or TWP 200 Series. I built a 12 x 20 all Cedar deck. I let the deck weather for a year and a 1/2. I am now ready to apply effort to get my deck looking fantastic. My deck was power washed then I used a wood brightener. I then used a power orbital sander with 100 grit just to knock down the roughness. Now I am ready to stain. I purchased a semi transparent Pittsburgh Stain and sealer in 1, My question is …is the product good enough or what do you recommend? I live in northern Illinois , the deck gets a lot of afternoon sunlight with the Winter as well. Thank you. Pittsburgh is average or below average. Try TWP 1500 Series. We live in on the central west coast of FL (Clearwater area, west of Tampa). We are currently building our 10-year old a fort in the back yard using PTP (from Lowes). The top deck is 6′ off of the ground, and under the dappled shade of large Oak trees. We are looking for a semi-transparent stain in a grayish-brown color (I guess that would be driftwood?) that would allow the fort to blend in with the Oaks. Since there will probably be a half-dozen kids playing on this deck (and running up and down the stairs) most days, we need a rugged stain that will repel dirt and [slippery] mildew. 1) What stain would you recommend for our environment? Our summers are hot, with heavy rains; our winters are relatively mild, with the coldest temps dipping to 40 degrees. If possible, I’d like to keep the VOC on the low end – is that possible with an oil-based stain? 2) Since there will be kids running and playing on this deck – is there anything we can add to help give the deck and stairs a bit more grip for safety? 3) The Oaks drop a lot of pollen and leaves – which I’m sure will be happening during the staining process. Once the stain is dry, will we be able to scrape off the debris – or will it be permanently stuck in the stain? Also, is it safe to assume the partial shade of the Oaks will help further the life of the stain? 1. Try TWP 1500 or Armstrong. Both are low VOC oil-based stains. 2. No need with a penetrating stain. 3. Debris is not an issue while the stain is drying. Thank you for the quick reply, and information. Glad to hear #2 and #3 won’t be an issue! The Armstrong-Clark only has 50 VOC, that’s less than some of the “supposed” top latex stain-sealers (BEHR has 100 VOC), so I’m pleasantly surprised. I’ll also check out the TWP. I am staining a new pressure treated pine deck that has weathered for 10 months. I live in NE Ohio and the deck sees full southern sun with snow in the winters. I would like to try the semi transparent light walnut Restore a Deck water based stain but am wondering because of the intense sun, if there would be be a better semi transparent stain choice for UV protection and longevity. I was looking also at TWP 1500 Honey-tone. What you you recommend? Also, I tried the RAD sample and the wood really took the stain well. If I use the RAD should I apply a 2nd coat wet on wet the first year? Both the TWP and RAD will last about the same before a new coating is needed. Just one coat. If the wood is not dirty or graying, you can stain it now without heavy prep. Maybe just lightly wash or rinse it down first with a pressure washer. Thanks. I’ve read to do one coat and then a second coat while first coat is still wet. I’ve also read 1 coat now and a 2nd in 12 mos. what do you recommend? When I reapply in a couple years do I need to do the heavy prep or can I just reapply a new coat of stain? Do the two coats now wet on wet. For a fence, you will not need another coat for a few years. Do not use a roller. Stain pads or brushes. We are replacing the decking with new wood this spring: does anyone have any opinions about KDAT (Kiln Dried After Treatment) wood? It is pressure treated but then kiln dried and is ready to install and can be painted, stained, or sealed without a waiting period for the wood to dry. We added a deck to our above ground pool last summer using pressure treated pine. We were told to wait a year before staining, so I planned to stain within a week. We live in Michigan, so it sees some pretty harsh conditions over the winter. I’ve read SO MANY articles that I’ve gotten myself confused as to what to do, how to do it, and what to use! Do I need to prep it? If so, how do I do that? What’s the best stain for my environment? (I wanted a “Sand” colored solid stain and sealant combo, but was warned by someone that it might peel.) Because of my health, I am unable to use a paint brush on the deck, which is quite large, and was hoping to use a sprayer. Is that possible with the stain and sealant you will be/are recommending? ANY help you could provide would be more than appreciated! Thank you! Clean and brighten for prep. Solid stains are more prone to peeling than penetrating stains. You cannot spray a solid stain. You can with a semi-transparent stain but you will need to back brush after spraying. No on staining all sides. Install, let weather for a few months, clean and then stain. We do not care for that brand. Afraid I may have messed this up. We built a cedar deck last year, and stained it with Behr maybe a month after it was installed. By end of season, it was about 80% peeled and gone. Last weekend I sanded the whole thing down with a mid-grit paper (maybe 60?). Then I read your site saying we should have waited longer, got a better stain, and avoid sanding. My question…what can I do now? – Is the wood considered ‘weathered’ if it was stained poorly over a year ago? – Should I wait now after sanding to restain? – Does chlorine from pool water have an effect on stain and if so, is there something to counter that? – The deck gets very slippery around the pool area…are there any products to help reduce that, post-stain? – Any risks in using a gas-powered paint sprayer to restain? Wait a few weeks and then clean and brighten for the final prep. You will be fine and good to go. Chlorine will “bleach” out all deck stains. No way to prevent this. Using a penetrating stain and you will not have issues with the wood being slippery. Look at TWP stains or Armstrong Clark. I would not spray a stain around a pool. Does it make a difference (with a pool) between an oil or water-based stain? You could use the RAD as well. Chlorine will have a negative effect on the stain no matter what the base is. Staining new Douglas fir tongue and groove on floor of covered porch. Do you need to wait months before staining? Yes, as the article states. Purchased new home with existing deck (rough cedar). Home/deck are 6 months old. Existing deck has grayed slightly and has some construction-related stains but nothing bad. Added/expanded new deck with “green” rough cedar because it was a match for initial deck. 1. How long to wait before staining (would like to use transparent stain)? 2. Will a cleaner or a Brightener remove gray from initial deck? 3. Will new deck need prep work? 4. Would prefer to use a water-based stain, but have been told that water-based stains do not work well on rough cedar…thoughts? 1. Depends on the brand but 1-3 months is normal. 3. Yes, after the weathering. 4. Nothing wrong with water-based deck stains for cedar. Doesn’t matter if rough or smooth. Look at Restore A Deck Wood Stains. have a new treated lumber deck put on last summer. I have cleaned it and now wondering what kinds of deck stain I need to put on it. It is in the sun all day. I don’t know if we need oil or a water base stain. The new decking wood has a green or brown colour for exterior use. Don’t we need to sand off that colouring as prep work before staining the deck? Not sure what you mean. Post a picture. 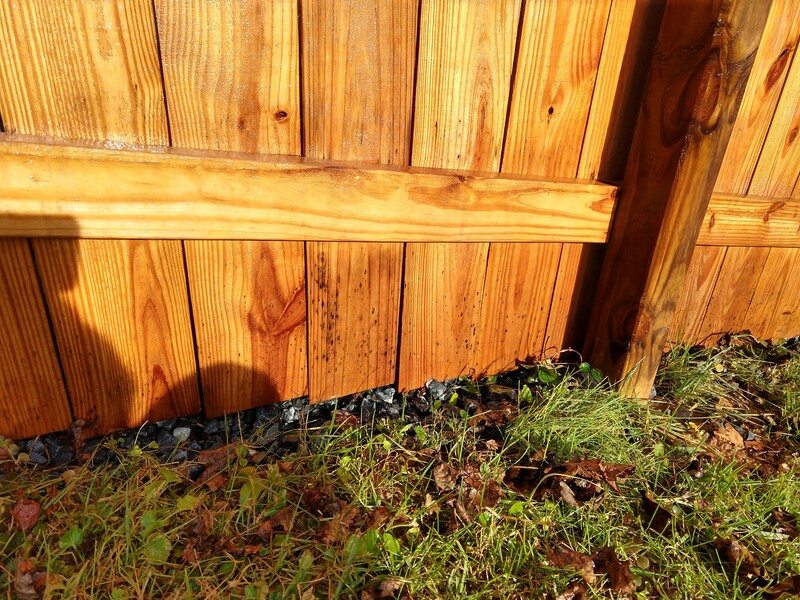 Has a pine fence installed 12 months ago, I want to put on an oil based and I live in GA.
TWP makes a great oil-based stain. It will not attract mildew. If you want a semi-solid, then try Armstrong Clark. It is oil based as well. I have a 10+ year old deck that was stained 10 years ago with Behr Premium Semi Acrylic. I’m going to strip it with the Restore a Deck products. I also replaced some bad wood last summer. How do I get the new and old woods to look the same when finished? It will help with removing the stubborn Behr Stain. Is there a brand of wood cleaner/brightener that works best? We installed a large pool deck last summer and have allowed it to weather. I’d like to get it stained late spring/early summer. I’ve just reviewed the stains you recommend but didn’t see a recommendation for a cleaner. but they did not offer a dark brown. Which of these would be best for my deck? Try WP 1504 Black Walnut or 1503 Dark Oak. Could I use a white type of solid stain on my deck after it has a dark finish on it? It has been dark fir several years . Possibly but that would depend on the brand and type of stain you used before? Hope important is to kill every last mold spore before applying TWP100? I have a new pressure treated pine fence in VA that had been weathering for 18 months and there are now little black spores at the bottom of maybe a third of the slats. I’ve tried both with the oxygenated bleach powder and with a mold detergent and chlorine bleach solution using a pressure washer for both. There are still black spots and I’m pretty sure some of it is still growing. Bleach is not killing it? If so, it might be what is called Artillery Fungus mildew spores. Very hard or nearly impossible to remove. Comes from plants and mulch near the ground. You can stain over it but it will show the black spots still. I think the bleach is killing it, but there’s still some black stains that I could never scrub off and I think some of them are regrowing. Half the fence was pressure washed in November and the rest two weeks ago. Will it be ok if there’s still small amounts of mold when I stain it? Gemini says to apply with a brush, roller or pump sprayer. Can it be used with an electric contract sprayer such as a Graco? Yes, you can use an airless sprayer. Your guys are awesome! Thanks again for the quick responses. 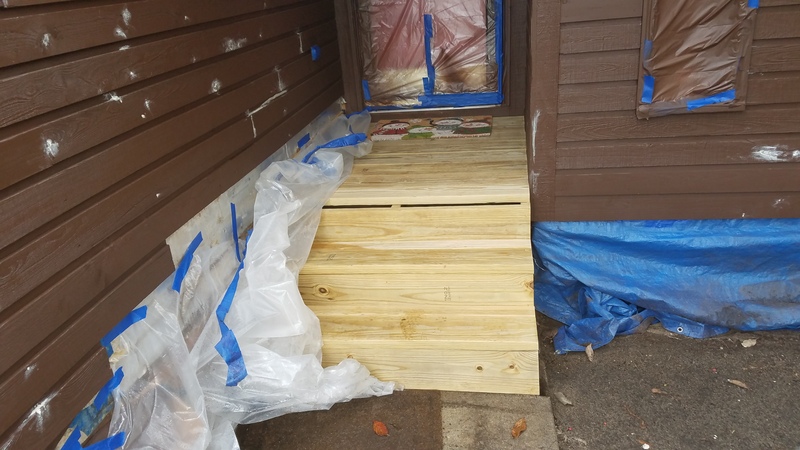 We had a large modular PT pine handicap ramp constructed mid Oct. of 2018 for my wife. I am following your advice and letting it weather a little longer before prepping and staining. My question is, is there anything I can add to the stain to help with traction as my wife uses a walker. As is, the ramp is slippery when wet. Traction strips do not adhere well and come up when the walker scrapes against them. If you can come up with a solution to this, you will be helping a lot of handicapped people. No, you cannot add traction grip to a penetrating stain. Thanks for responding. This may be a case where I will need to paint the ramp floor boards and add an traction additive which I found on Amazon.. Safety first!. I will stain the rest of the ramp handrails etc.. Will make it pretty. It has grip in the product. Once I stain I only apply once and wait one year and apply again. After that, I should be fine for a few years? When I put on that 2nd coat do I need to clean, brighten, power wash or anything other like that? Sorry for the questions I am just trying to clarify to do it right the first time. After that second coat, you should be fine for 2-3 years. Yes, you have to prep when reapplying. Best to follow the directions of the stain brand you are going to use. Hi. I have been reading the questions posted and a going back to articles suggested, but I still have questions. 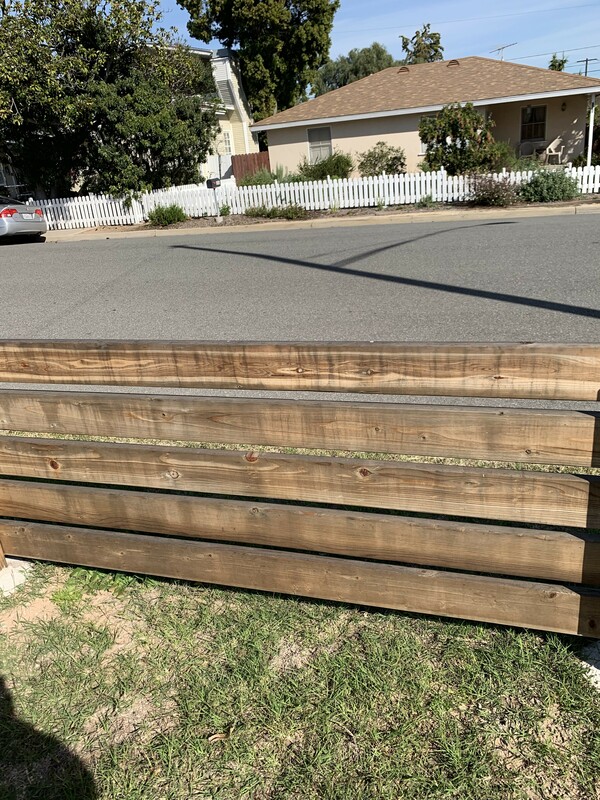 I want to stain a fence a deep red color that is not installed. The wood will be pressure treated lumber. My 6X6 pressure treated posts have been in my yard for about 3 months. I would like to stain the wood before putting it up. My understanding is to clean and brighten them before the stain is applied. I don’t need to power wash them as other sites have stated? I have hot sun about 10 months out of the year so I am worried about the color fading – but the article advised I should not do more than 1 coat? Should I use an Oil-based stain? Also, I have seen some stains with a sealer. Should I buy a stain with a sealer and do I even need to seal it? If I seal the fence what is the process to apply a second coat of stain in 7 months? Do I have to remove the sealer? -You pressure wash while using the cleaner and brightener. -Water or oil based will work. Just one coat. -Deck stains are sealers. You cannot apply a deck sealer over a deck stain. I’m replacing some rotted pine board-on-board siding on a mountain house in NC. I’ll be trying to match the rough sawn finish to the rest of the house. The previous owner used Cabot semi-transparent oil stain (Burnt Hickory). Do you recommend that I use the same product for the new boards and can I apply it over the old siding without prep? Additionally, do you recommend any additional sealing to the cut ends as I think the original installers missed this step which led to the rotting issues. First time on this forum…thanks for helping. Best way to get it to match is to strip all of the old Cabot stain off, down to the bare wood. This way you can go with any brand and color. Sealing cut ends is not going to stop or prevent rot. This forum is awesome! My question…8 month old pressure treated deck cleaned with Valspar prep. Dried good and bright. Found Olympic elite woodland oil insanely reduced so on it went at 70 degree application temperature. First night went down to 44 degrees then 70 daytime , then 50 at night. Another 70 plus degree day. Deck getting little direct sun. Looks good but slightly tacky when I walked on it this 3rd evening. Had a humid day today also. Patience? Will it just take a little more that the instructions stated dry time? It should cure correctly and stop from being tacky. Give it a few more days. Look at Permafill by Gulf Synthetics since you are using a solid stain. Patch after prep but before using the solid stain. 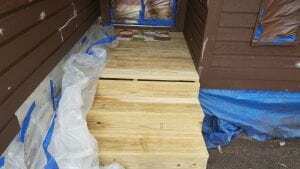 I have a new 12′ by 150′ pressure treated wooden deck. I live in south Mississippi (Pass Christian) and this deck will get a fair amount of sun. After three or so months, I would like to apply a good semi transparent deck stain that will be long lasting. I was thinking of something like Armstrong – Clark wood stain driftwood grey. Is this a good choice for this environment or should I consider a different type of stain. Yes, that will work. Another good option for a gray color would be the Defy Extreme Driftwood Gray. I wish I found this website earlier! 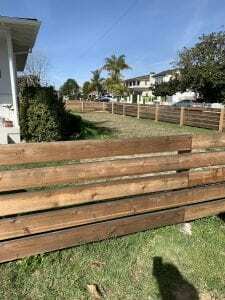 We had a redwood fence with 2×6 horizontal boards installed in August. Unknowingly, we sanded and oiled immediately after installation, and now the fence looks horrible! I bought a pressure washer with the intention of fixing it, but would like your advice first. 1. I’m seeing that we need to use a cleaner first. Do we also need a brightener with 5-6 month old wood? It is greying already and is showing signs of green mold. 2. What type of stain can you recommend for 2X6’ sanded redwood? We originally used Preserva clear oil for redwood. I like the natural colors that came through with the clear oil but am now thinking we need a tint for UV protection. Can you recommend a tint/stain for redwood that won’t overpower the natural colors too much? We live in California a mile from the beach. Please help me protect my investment! Post a picture of the current condition so we can advise on proper prep. Here ya go. Really appreciate your input. You will need to strip and brighten this for the prep. It will be easy. Use the Restore A Deck Stripper/Brightener Kits and pressure washing. Once done, try the Armstrong Clark or TWP 1500 Series wood stains. Thank you for the advice. I really do appreciate it. Final question: should I use a paint sprayer for the stain or roll/brush it on by hand? Use an exterior stain pad or brush. Rollers do not work well with semi-transparent stains. I’m not sure if my first comment posted. Trying again! 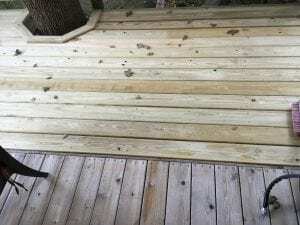 I just had a new Redwood deck installed and I plan to use RAD transparent stain in five to six months, but I’m reading where I need to use a cleaner and brightener before the transparent stain. What do you mean by using a cleaner and brightener? You have to prep new wood. Use the Restore A Deck Cleaner and then the Restore A Deck Brightener. There are numerous articles on this site in the main menu about how to do this. Thanks for the reply about the deck. I just brought a house with a cedar fence that is weathered and appears to not have been cleaned in 10 years. Would you recommend using the RAD cleaner, brightener, then the transparent stain on the fence? I live in Southern Idaho. Yes. Works great on fences and the stain will last 2-3 times longer as well for vertical fences over a horizontal deck floor. Thanks for all you do for us homeowners. You are welcome! Post some pictures when done if you have time! 1) How do I know the moisture content to ensure I can seal it right away? 2) I want to retain the cedar wood color so I need a UV protectant that isn’t found in clear stains…is that correct? Any recommendations are greatly appreciated. 3) I also want to avoid tannins staining. Any suggestions on that? I’ve read you can pretreat but I have no idea what to do. We are using stainless steel screws (if that matters…in hopes of slowing the rust process). 1. No need to worry about this. Just make sure the wood dries for a few days after any rain. 2. You must have a tint for UV protection. The more color/tint you have, the longer it will last. 3. You cannot stop this if it happens. It happens internally if it happens. Very rare so no need to worry too much about it. I put up a new deck in August. treated wood, It gets sun 7 to 7. 4 seasons, Gets hot at least June, July and August. I know stains will fade and will need to be repeated every two years or so. Maybe that is my best choice. I used a product called Rescue at my old house looked beautiful but only got the morning sun. Is there a product like that I could use in hot sun. I have completely sanded, to 80 grit, my east facing T&G old heartwood pine covered porch. After sanding I realized that the porch was repaired with newer pine in one section. My wife would like a gloss finish. What is the best stain to achieve this finish? Do I need to do any other prep work? We live in Florida. The covered porch faces east and has sun in the morning. Thanks for doing this forum. I was on my way to Lowe’s to purchase Cabot gold sunlit walnut and decided browse the internet for info. Repaired 20 year old deck with new wood. Still some old wood. How do I prep new/old wood when there is a combination of both? How long to wait for the PT new wood to cure? I’ve read from 2-12 months. That’s quite a range. How do I know when new wood is ready to be sealed. I understand I need to clean, brighten, dry then seal. I want a clear sealer if possible. I’m concerned a stain with magnify the difference in color between the old and new wood. Let the new wood cure for 3-12 months, prep, and then stain. Clear Sealers will offer zero UV protection from graying. More pigment will blend the new and old wood better. Yes, you still need to wait. Wood type does not change that. Do not use a paint. Ask a Question or Post a Review… Thanks so much. I think we will have to go with paint. My understanding is that KD wood will not require any delay if we use exterior paint. Ask a Question or Post a Review…Oops missed the part where you said don’t use paint. Why not? My understanding is that kiln dried wood can be painted immediately. Built a 950sq/ft 2 tier deck south facing last year . Bottom deck supported by 10’x6”x6” southern pine posts. Was told by vendor to leave the deck at least a season before staining. All the lumber was “premier grade” and the price reflected that…after 3 months I had to replace one of the support posts due to severe cracks over the length of the post. We don’t live here (CT ) all year round so when I came back this year to seal the deck I couldn’t believe the condition of the wood support posts, deck boards and handrails. The wood was delaminating and checking and cracks everywhere. I got the vendor and the wood supplier out to look at the issues and believe me there were many… I followed up with a 40+ page report to the manufacturer detailing the issues. He in turn sent it to the Southern Pine Inspection Bureau (SPIB) who basically said the issues were due to the deck NOT being sealed. But they did say that the deck was still structurally sound…. It is now November and I have to seal it! The weather will be high 30’s to mid 40’s. If I apply a waterbased stain and it does not freeze will the only issue be slow drying??? Thanks for you’re input. You cannot do it in these temps. Wait until Spring. Thank you for the fast response to my previous posting. 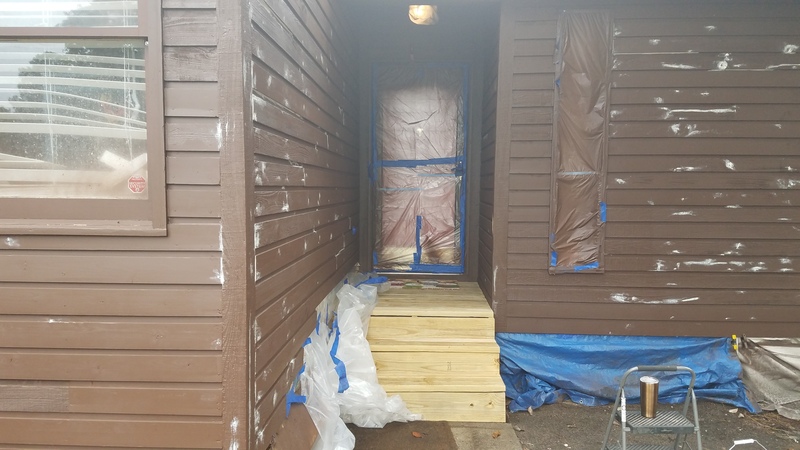 Attached is a pic of the lower deck where I had stored some planks from last year…the problem is that the non weathered area really stands out. Before staining in the spring will cleaning the deck help to equalize the color so that I can use a semi transparent stain without too much of an obvious color change.. I have readily acces to the TWP product if it would work.. This week I am replacing some handrail boards and 6×6 posts being supplied by the manufacturer. Letting the wood naturally weather and prepping in the Spring will help to get a more uniform appearance. I live in Michigan and just had a new deck built with pressure treated wood. I am looking for the best deck stain to use because where my deck is positioned it is exposed to the sun pretty much all day long, and my deck is going to experience all four seasons and winter is really bad and i am not staining my deck for about another 6 months. I have a grand stairway porch with stairs coming up each side from the patio to a main landing and then one stairway coming from the main landing up to another landing which leads to the front door. It is the main entrance for my family, our guests, my customers as well as it is the main drop zone for all of our packages which we receive about 1-2 packages a day because of my home based business. So in the winter time I shoveled my old deck with a plastic shovel and used a salt substitute on it if it had ice frozen to the wood, or if there wasn’t any ice just the wood i still used the salt substitute to prevent ice from forming in between me shoveling so that way i am able to keep my porch as free of snow and ice as possible so that way my family, our guests , my customers and our delivery people are able to get up to my house, and back down to their vehicles as safely as possible. Will I be able to use the salt substitute on my new deck this winter or will that eat the untreated wood or complicate the staining process in the spring ? And will i be able to use the salt substitute on it next winter after it is stained or will it compromise the stained wood because of it getting frozen and thawed repeatedly. Or should i just shovel it and only if there is ice attached to the stained wood use the salt substitute. Limiting the amount and frequency of it getting frozen and thawed. The salt should not harm the wood but it will harm the stain down the road. No deck stain will be immune to it. It says do not sand new wood here. But it says to sand wood in other articles of advice. And the 80 grit for the stampings. I’m thinking that you sand new wood before staining once you’ve allowed the time for it to dry out. But then again, I’m thinking I dont sand it before staining. 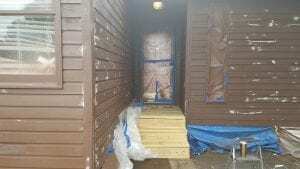 I’m only doing a newly built tiny porch of pressure treated standard 2×6’s and 2×4’s, from box type store and wanting to use semi transparant stain. About every year or two. Thanks. You only sand if needed. We do not suggest it if avoidable. 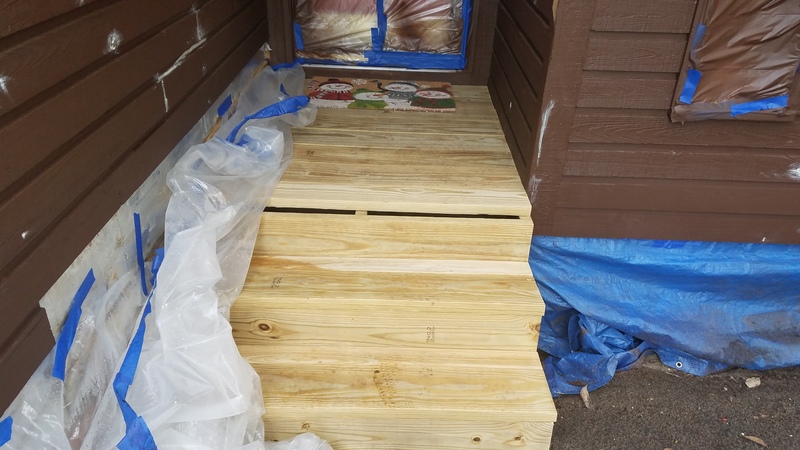 Our front porch was rotten so I built new porch using 2×6’s, 2×4’s. It’s standard lumber(pine I guess), from 84 lumber here in SC. Came pressure treated and it’s natural color is fairly pretty being raw, a decent almond yellow. She want’s to semi color stain it almondish yellow to keep it’s natural color and to see the grains. House is all cedar boards, with solid stain(padre brown from HD, 10yr-25yr). How do I do this porch? Sand 1st? P wash 1st? Conditioner before stain? Use rag instead of sprayer like I did on house? Btw, ANY brand/type of stain is fine w me. Just sort of confused because most things are about “deck”, not 2×6’s, 2×4’s. THANK YOU!! As the article states, weather the wood for 3-6 months, clean and brighten for the prep, do not sand unless needed, stain with 1 coat of a penetrating stain. Try TWP 100 Series. We added to our deck and have two different types of wood, older redwood and new pressure treated wood. Any suggestions on a stain color that would be best? Colors will not blend the two different types of wood. Opacity will do a better job of doing this. Try a semi-solid color like Armstrong Calrk but you will need to let the new wood season for a year first. Do I need to apply a clear coat to a new pressure treated deck and if so when. My deck is approximately 600 sq ft. How many gallons of clear coat do I need for that and I want to include the railings and stairs. Also do I need to clear coat the bottom side of the deck>? No, do not apply a clear coat. It will do nothing for UV protection. You need a semi-transparent stain. After the weathering, prep and then stain. No need to stain undersides. How many feet will a galloon of stain cover for first time staining? Varies widely based on the brand of stain you are using, the type of stain, and the wood type. Our new deck is over a year old. I’m ready to stain. Live in Iowa, it is almost the end of October but calling for temps in the mid 50’s day-upper 30-40 nights..can I go ahead and prep and stain or should I wait till Spring? It cannot drop below freezing the first night after staining. If the weather cooperates go ahead and do now. If not, Spring will be fine too. So I thought I’d go ahead and try yet this Fall..just cleaned it with Pittsburgh deck cleaner…have fuzzies…didn’t know about brighteners…can I put a brightener on tomorrow? Will that get rid of fuzzies?? I just built a cedar fence in Michigan. I know now that earlier in the summer would have been better, to allow drying before staining…. but I didn’t know that before and now the fence is built. I plan to use white stain. Currently planning to stain next week. Would it be better to let it weather over the winter and clean/stain in the spring? What product would you recommend for white(semi-translucent OK) stain on cedar in my conditions? We do not know of any quality white semi-transparent exterior wood stains. You would have to custom mix this and that means acrylic based and will most likely be a semi-solid or solid stain. Have a new redwood deck. It has been weathering since March. I’m about to hire someone to stain it. Does it have to be sanded? No but it does have to be prepped. I am about to build a small 2.5′ fence outdoors here in Los Angeles. I purchased 2 x 6 con heart redwood planks from HD and plan to install them horizontally. I plan to install them this week and will wait as long as I can before staining, but can only wait until January before we have a party. My question is, should I clean them now with wood cleaner or wait until just a few days before staining? Prep a few days before staining. We installed 1200 square feet of new cedar decking 8 months ago. We are on the dry side of Oregon-hot summer, cold winter. 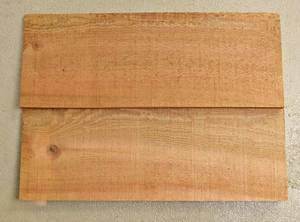 We are looking for a stain and sealer that mimics the look of the cedar when wet. Suggestions please!! Try Restore A Deck Wood Stain in Natural or TWP 115 Honeytone. Make sure to prep. Use a deck cleaner and a wood brightener. I purchased the Armstrong Clark Deck Cleaner & Brightener per your suggestion. After testing it on a extra single board, and staining with my 3 different color samples, the look of the board looks almost fuzzy; not smooth like the original board, and shows sections of tiny little holes down the middle of the board. No idea what that is from. I followed the instructions per the package, however, instead of using a power washer to remove the cleaner and brightener, I used a standard hose with fairly good pressure….so I know I didn’t rough up the fibers with a pressure washer. I really don’t want my whole brand new deck to look like these sample areas. Do you have any suggestions as to what may have caused that? You must have tint in your stain if you want UV protection from graying. Clear = No UV protection. Does this advice also apply to tongue & groove porch flooring? We are replacing our old Douglas fir 4” on our covered/open porch and are unsure what preparations are best before installation to ensure longevity. We want a more natural look instead of painting. Would you recommend a semi-transparent oil-based stain like AC or TWP? Yes on the article and yes on the stain brands. Weather the wood after install, prep, then stain. Just one coat. So even if the t&g is kiln dried, it should be installed without any protection on the interlocking wood? Would it be different or better to air the wood uninstalled and stain before installation so it’s protected on all surfaces? Just worried about water becoming trapped in the t&g— we are in MN with huge amounts of precipitation, freezing, and snow melt. Thanks again! Yes. You cannot pre-stain. No advantage and could create more issues than good as the wood needs to breathe.